Some people believe that God will judge and condemn me for LOVING "sinners" and telling them GOOD NEWS in that God LOVES them and that at the end of life's journey God will not assign them to everlasting punishment in the torture chamber of hell fire. Believe that God will not judge or condemn them for HATING "sinners" and telling them BAD NEWS in that God HATES them and will assign them to everlasting punishment in a torture chamber of hell fire at the end of life's journey! God is LOVE...which of the above would is the quality of a LOVING God? The scriptures declare that people don't initially intentionally seek God, but that God initially intentionally seeks people. Which seeking God would say; "Come unto me all you that are burdened and heavy laden and I will give you rest"...do you think people would be drawn to? 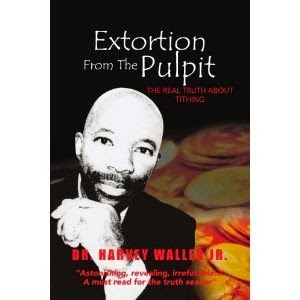 Preachers who extort money from God’s children under the pretense that they are giving to God when they give to the cause are manipulating manipulators will one day answer for their deceptive tactics. Malachi 3:6-10 is NOT a commandment for New Covenant Believers to give 10% of their income, as the fear-mongering money-grabbers wrongly preach. Text taken out of context is a pre-text to deceptive text because the text is taken out of its historical and contextual context. According to Malachi 2:1' who is God talking to in Malachi 3:6-10? THE PRIESTS..."This commandment IS TO YOU, oh Priests." And who was to bring the tithe into the temple? THE PRIESTS, not the people in the congregation.